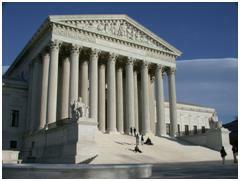 In a unanimous opinion released today, the U.S. Supreme Court sided with a disabled student and his family who did not believe a Colorado school district was doing enough to provide an adequate education. School districts must provide students with disabilities more than a “merely more than de minimis” education, according to the opinion. That language was developed by lower courts over time as a legal standard and upheld in a separate case, Board of Education of the Hendrick Hudson Central School District v. Rowley. It was also used by a lower court that decided because the student in Endrew F. v. Douglas County School District had received “some educational benefit,” the Individuals with Disabilities Act (IDEA) standard to provide free, appropriate education had been met. The parents of Endrew F., a minor with autism and attention-deficit/hyperactivity disorder (ADHD), sought private school reimbursement under IDEA after pulling their son from public school over a proposed IEP for his fifth grade year. “Rowley did not provide concrete guidance with respect to a child who is not fully integrated in the regular classroom and not able to achieve on grade level. A child’s IEP need not aim for grade-level advancement if that is not a reasonable prospect. But that child’s educational program must be appropriately ambitious in light of his circumstances, just as advancement from grade to grade is appropriately ambitious for most children in the regular classroom. The goals may differ, but every child should have the chance to meet challenging objectives,” the opinion syllabus states. On a side note, Judge Neil Gorsuch, President Donald Trump’s pick for a vacancy on the Supreme Court, has relied on the minimal education standard in the past. You can read more about that here. Previous PostBill to bring guns into more places of worship in House committee todayNext Post Five questions with Chris Sgro of Equality N.C.